The Distillers - "Man vs. 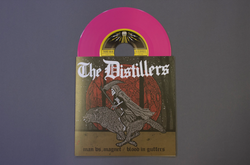 Magnet" b/w "Blood in Gutters"
On Valentines Day, Feb. 14, The Distillers will release a new 7" on Third Man Records. The two-song release is officially titled "Man vs. Magnet" b/w "Blood in Gutters" and is their first physical release in 15 years. The song premiers in 2018 and it will be released on limited edition pink vinyl for Valentine's Day. The band first formed in 1998, disbanded in 2006, and regrouped last year. They have previously released albums on Hellcat and Sire Records.